In this two-day workshop you’ll learn how to take scrap fine silver or casting grain, pour an ingot, and mill wire to a variety of bezel widths. With only about one ounce of clean scrap metal you’ll be making a variety of bezel wire in a relatively short time. Learn to solder 30 bezels at once, mill an ingot in the rolling mill and use a drawbench and drawplates to make wire. Ryan will address traditional settings as well as bezels for non-traditional stones. Students should bring any hard-to-set stones to the class. This class should improve your knowledge of some important metalsmithing techniques and reduce your overall production costs. 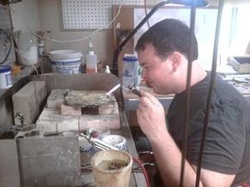 Ryan has a BFA from Bowling Green State University, was published in Lapidary Journal May 2012 and is Michael Boyd's assistant. Ryan's website is http://www.ryangardnerdesigns.com. Ryan is the 2013 CoMA conference chair and he presented 'Stone Manipulation at the Bench' for the BoMA August 2012 meeting. Tools and Materials: Students need to bring one ounce clean scrap fine silver or fine silver casting grain, flat and round nose pliers, saw, cutting shears, tweezers, soldering tweezers, solder pick, bezel pusher, separating discs, sanding discs, fine point sharpie, hard and medium silver solder and ingot mold (optional). Students may also bring any hard-to-set stones to the class.